There are two situations when formatting SD card or USB drive: active or passive. For example, you may just want to free up the space, or Windows forces you to format the card for normal use. In either case, the question now is that Windows was unable to complete the format. There is no doubt that your SD card or USB drive is in trouble. You should know that passive formatting will get data lost, and it’s better to try RePicvid Free Photo Recovery to extract and restore important files from SD card/USB drive first. SD card or USB drive is infected by virus, leading to unfinished formatting. SD card or USB drive is damaged/corrupted and Windows can’t format corrupted SD card. Then what can we do to solve “Windows was unable to complete the format”? Here we list four methods to fix this problem. The full name of chkdsk is check disk. This tool creates and displays a disk status report based on the file system used by the detected partition. It also lists and corrects errors on disk. Try these steps to solve Windows was unable to format SD card. Step 1. Insert the SD card to a card reader and connect it to computer USB. When Windows prompts formatting, click “Cancel” and check the “Properties”. Use the tools in the Properties directly – Start checking. You will find it fails to check disk error. Step 2. Click “Start” – “Run”, and enter “cmd” – “chkdsk E:/F” (E is the drive of SD card, and /F is the repair parameter). This way will not lose any data, just repair the corrupted SD card. “Disk Management” is an important component in the control panel “Computer Management”. Using the this tool, you can list all the disk conditions at a glance and manage the individual disk partitions. If Windows fails to format your SD card, follow the steps below to fix it. Step 1. Connect SD card to computer with card reader. Right click “My Computer” and select “Management”. Step 2. Click on “Disk Management” on the left side of the window, then it displays information about all storage devices in the current system. The “Removable disk” is the SD card to be fixed. Step 3. Right click “Removable disk” and select “New volume” – “FAT32”. The system will prompt the partition creation is success. Then format the SD card again. Through the above steps, the SD card can be repaired. But this way will corrupt the data because it has been formatted. Diskpart can be used to manage the partition of hard disks. This command prompt will repair SD card that Windows was unable to format. Step 1. After “run”, enter “cmd” to open the command prompt window, and then enter “Diskpart” to start it. Step 2. Type “list disk” and press Enter. Step 3. Carefully spot the disk that you need to format and type “select disk 2”. If you choose the wrong disk, it will erase all data. Step 4. Type “clean” to format the selected disk and press Enter. Step 5. 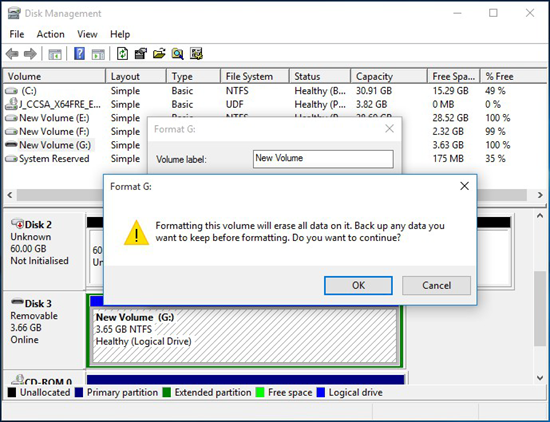 Type “create partition primary” and “format fs=fat32” to complete the formatting. Then close the window until it is finished. General SD card repair tools and formatter tools belong to a type, which is forced formatting. This way is likely to repair your SD card, but it can damage the data. If your SD card is certified product, the repair success rate is very high. This sort of software is more, mainly developed by SD card manufacturer, such as the famous Sandisk SD card formatter tool. If it still fails to access your SD card, then you might as well consider a new one.